1) it’s the second song I have written with harmonica, and I actually feature it pretty heavily. 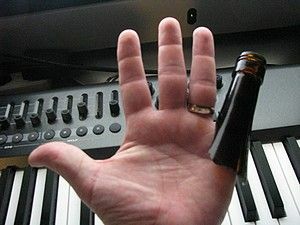 2) I made my own glass “slide” for the guitar part – and broke several in the process…I finally ended up dumpster diving a local restaurant for spare wine bottles for the one I used on this song. 3) banjo is provided by Matt and his virtual collaboration is much appreciated. He gave me quite the buffet of good musical options to use in the song! Lets play some harp now…. This entry was posted on Tuesday, July 12th, 2011 at 12:13 am and is filed under new songs !. You can follow any responses to this entry through the RSS 2.0 feed. You can leave a response, or trackback from your own site.